After decades of oppression during which many aspects of Hawaiian traditions and language were outright banned in the Hawaiian Islands, there came a light amongst the darkness. Aptly named the Hokule’a, after the bright star Arcturus, this traditional Hawaiian voyaging canoe first set sail in 1975. It set out to prove that the first Hawaiians didn’t just drift here on the currents, and ending up igniting the pride of Hawaiians. It has sailed the Polynesian triangle between Hawaii, Tahiti, and the Marqueses Islands several times. And has just returned to the Hawaiian islands after a record setting around-the-world sail during which it continued to share the Aloha spirit and reinvigorate Hawaiian pride. 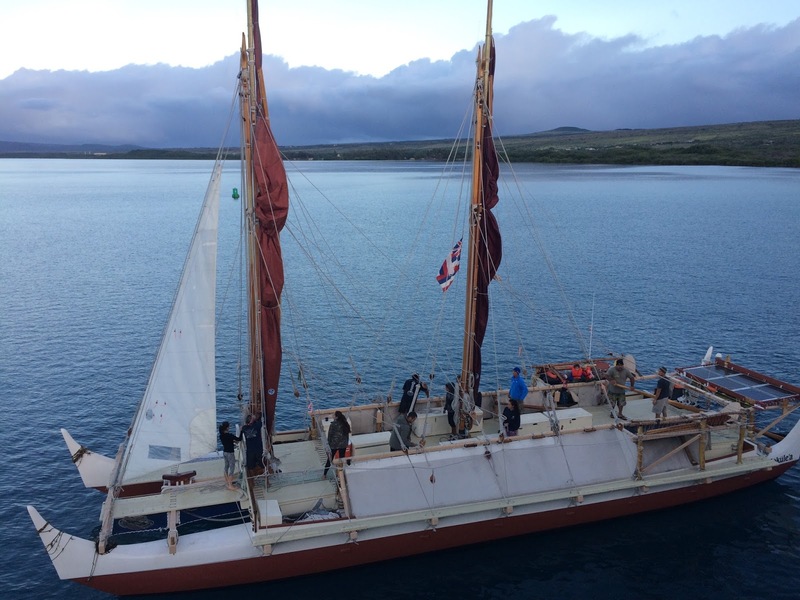 We were lucky enough to share a harbor with the Hokule’a at Molokai this week. I made sure one of our documentaries was about the Hokule’a so the guests knew the importance of the sailing canoe. We checked out Herb Kane’s historic art gallery containing a few paintings of the Hokule’a, which was created with the aid of his drawings and research. And we were lucky enough to have Danny Akaka onboard as a guest presenter. 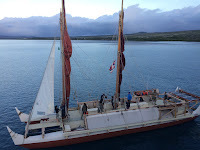 Danny spent time sailing onboard the Hokule’a as their cultural advisor. I thought of him this morning as the ship sailed by the SFX, conch horn blowing loud for all to hear. Hawaii is a place filled with traditions like this…if you know where to look. 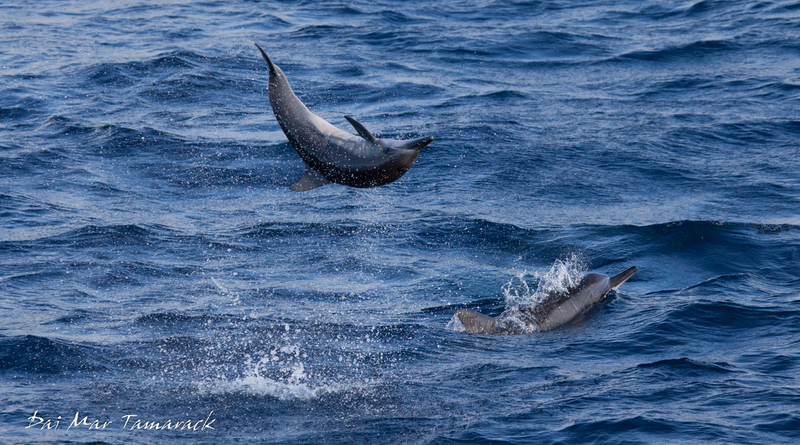 Any time I get to swim and photograph sharks I get pretty excited. I have traveled around the world just to have shark encounters, like shark cage diving with great whites in Africa, to shark feeding frenzies in Fiji, thresher sharks in the Philippines, and even a wild shark dive off the east coast of Florida. You can follow the links to see photos from all of those dives. But I get really excited when I just happen upon a shark which is exactly what occurred yesterday off the lava rock coastline of south Kona. We had just wrapped up a wonderful snorkel in Kealakekua Bay, near Captain Cook on the Big Island. As we motored our zodiac around the corner we were about to pick up speed when we spotted a large pale grey shadow just under the surface. It was big so I immediately knew it was something special...maybe a manta ray or even a small whale shark. I quickly grabbed my fins and mask, slid off the boat into the water, and swam towards the pale grey shadow...not knowing for sure what it would be. At first I could only see that it was a big shark. Then as I swam nearer the shark turned its head away from me and I could instantly see it was a big scalloped hammerhead shark. It kept its distance and swam a little deeper. 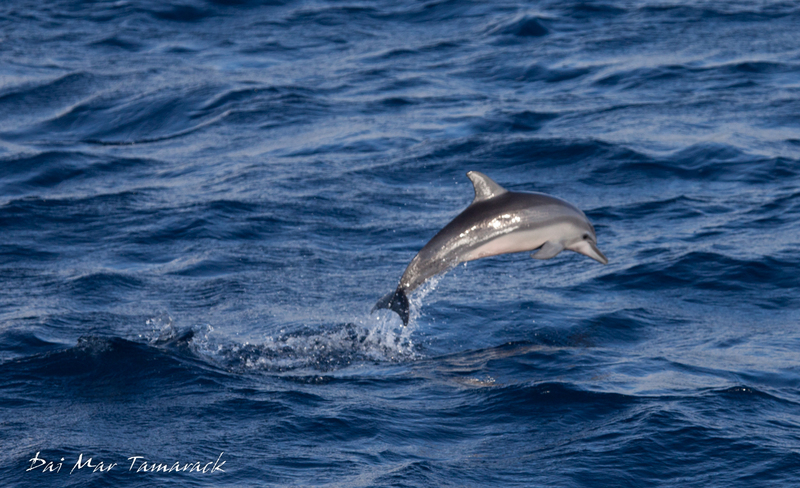 Then, as if it knew what I was thinking, it circled back towards me, giving me one chance to dive down near it before it swam off the ledge into the deep blue. It was a magical encounter with such a big, powerful, and graceful animal. One that I will not forget. In my job leading adventure cruise trips among the Hawaiian Islands I find the more fun I am having, then the more fun the guests are having. So I try my hardest to get out there and goof off, especially during the swim parties. Here I am trying paddle board headstands, 360's, and a 'point at the camera' leap off the top deck. After seven months of working in the Pacific Northwest, British Columbia, and Alaska, I am finally back in the Hawaiian Islands. I'll be running the expedition side of things again on the UnCruise boat Safari Explorer. 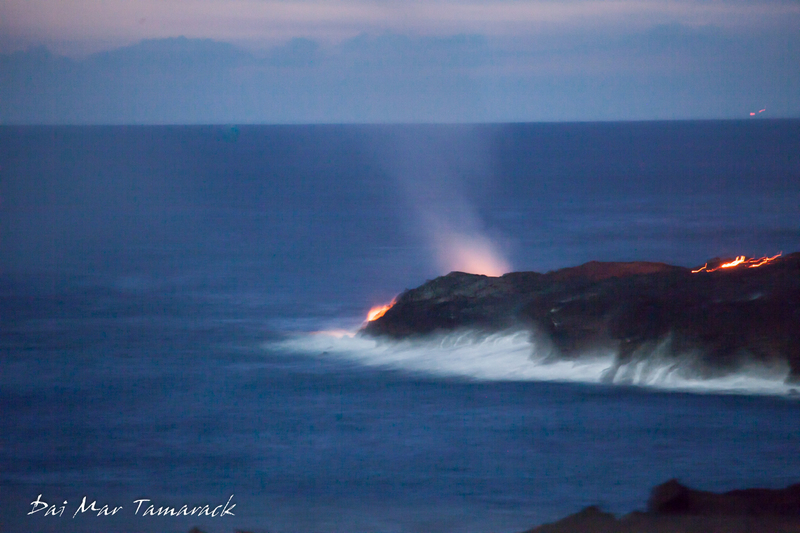 The trips are one-way, week long, adventures from the Big Island to Molokai, or vice versa. I am excited to see alot of veteran crew back again this year as well as some fine new additions. 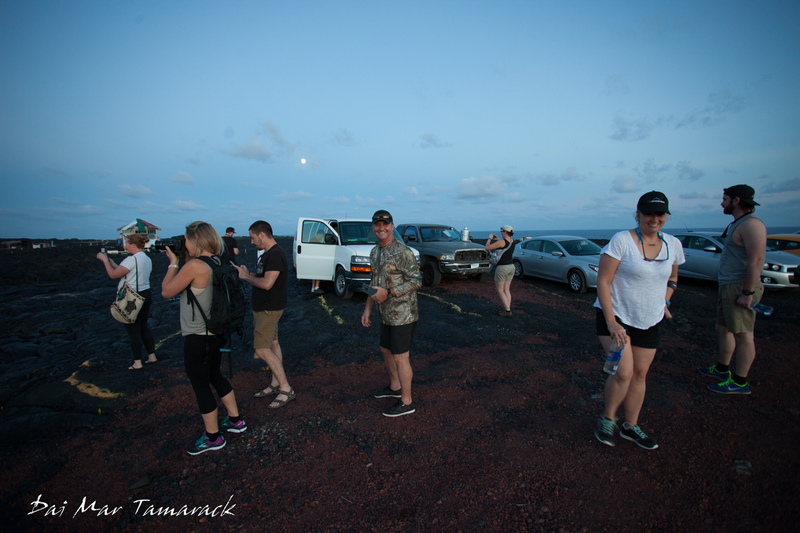 We managed a few days of training before the boat showed up and again I took advantage of that time to get the crew over to the Hilo side of the Big Island to see the active volcano. The flow has moved a little from last year and is just trickling into the ocean now compared to the fire hose that caused a huge steam cloud last winter. We tried to walk uphill towards the fresh surface flows but were eventually turned around by the sheer distance across the treacherous terrain. Our first weeklong trip is already in the bag. We had a packed boat with wonderful guests. 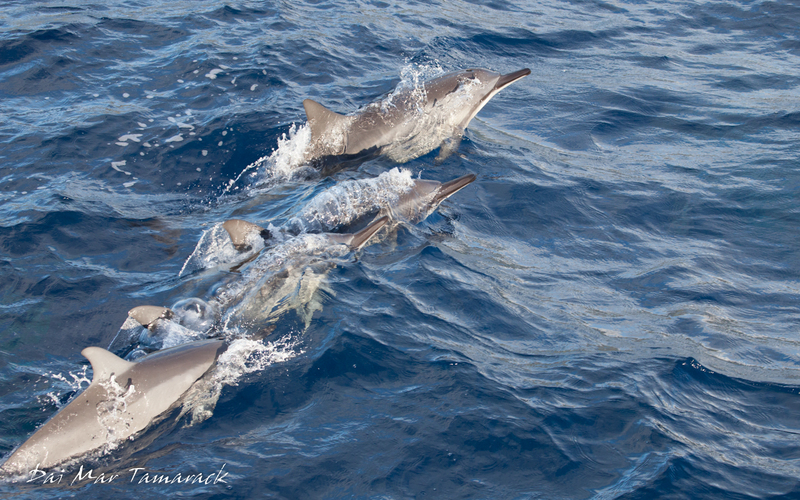 And despite not seeing manta rays on our night snorkel we did have many dolphin encounters including the playful spinner dolphins pictured here, and we swam with more turtles than we could shake a stick at. An early humpback whale was added to the list right before we took the guests on a rare backwall Molokini snorkel. I always worry that my Hawaii information will disappear in the months that I spend guiding up in Alaska, but again it came rushing back to me when I needed it and now I am feeling like mid-season form. The crew is also firing on all cylinders making for a very smooth trip. The sun just rose here in Molokai so I'm off for an all day adventure of waterfall hiking and cultural immersion. Hopefully lots more Hawaii post to come!